The heavy downpour didn't stop kids from having fun. 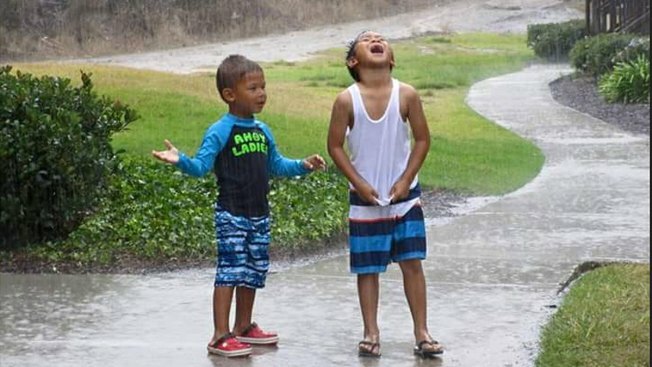 This image from NBC 7 user Anna Alvarado shows her children enjoying the moment. San Diegans woke up Monday after record-breaking storms brought up to four inches of rain in one community and more than an inch in many others. “Amazing is the best way to put it,” NBC 7’s Meteorologist Jodi Kodesh said as she described the amount of rainfall San Diego County received in 48 hours. As of 4 p.m. Sunday Ramona was reporting more than four inches of rain. The area surrounding MCAS Miramar received 2.5-inches of rain. Residents in Rancho Bernardo and those near Lake Wohlford saw more than an inch of precipitation over the weekend. Saturday's rainfall broke records in at least 11 locations, including five places that had the most rain ever recorded on any day in July, according to the National Weather Service. In San Diego County, rain totals shattered records set 113 years ago, Kodesh said. There was a little sprinkle activity over the deserts east of San Diego early Monday morning. “We’re not completely out of the woods,” Kodesh said adding that even though the county was drying out there was still a chance of more rain. There was a slight chance of showers or a pop-up thunderstorm through noon followed by humidity with mostly sunny skies. The most serious storm-related damage occurred in Riverside County where an elevated section of Interstate 10 collapsed. One driver was injured and the main route between Los Angeles and Phoenix was cut off when a bridge that carries eastbound I-10 across a wash about 50 miles west of the Arizona state line washed away early Sunday evening. The California Highway Patrol said they turned around traffic headed toward Arizona. The westbound side of the freeway remained intact.